"It snowed and froze in parts of Europe and North America. Crops were ruined, triggering the worst famine of the nineteenth century [and] became known as “the year without a summer,” a climatic anomaly that affected the northern hemisphere"
We now know this is at least partly due to the massive Tambora volcanic eruption. 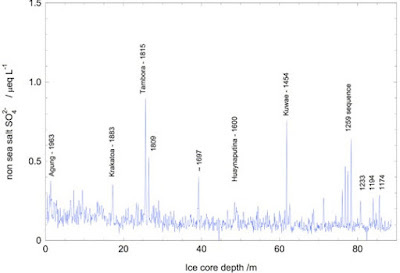 "Evidence of the long range of the emissions from Tambora has been found in the high sulphur content in samples of polar ice from the time, says paleoclimatologist Robert Mulvaney of the British Antarctic Survey [...] “Very large eruptions (such as Tambora) can lift material very high in the atmosphere, and into the stratosphere,” explains Mulvaney. “Once in the stratosphere, the sulfur dioxide can oxidise into sulphuric acid, which is taken up by tiny water droplets to form a haze in the stratosphere that can reflect incident sunlight back away from the Earth, causing less light to penetrate through the atmosphere, and the Earth to cool.” This sulphuric acid circulating in the stratosphere is then detected in ice cores. In this way, scientists can estimate the volume of emissions from an eruption." Here's the evidence showing it's happened at huge scale at least a couple times per century, so inquiring minds want to know "when's next"?